Includes: Introductions, Psychic round robin (readings at your tables!) and Team Lead investigation at the historic home of Cynthia Dunbar Thoreau (1787-1872), Mother of Henry David Thoreau. Thoreau, David Henry, b. July 12, 1817, Concord, Middlesex Co., Mass. ; writer, naturalist, philosopher, pencil maker, surveyor, Transcendentalist, inspector of snow storms; d. May 6, 1862, Concord, Middlesex Co., Mass. ; bu. New Burying Ground, Concord, in the Dunbar family plot; moved with other family members to Author’s Ridge in Sleepy Hollow Cemetery, Concord (essentially, up the street) in the 1870s. Changed name to Henry David on his own after he was graduated from Harvard. “Our Margaritas restaurant in Keene, New Hampshire is perhaps the most historically significant out of all the Margaritas locations. 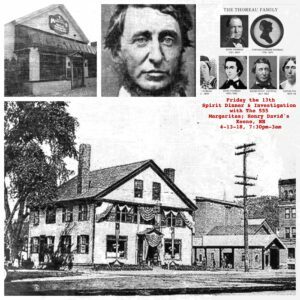 That’s because our Keene, NH Margs is located on Main Street in what once was the home of Henry David Thoreau’s mother, Cynthia Dunbar. 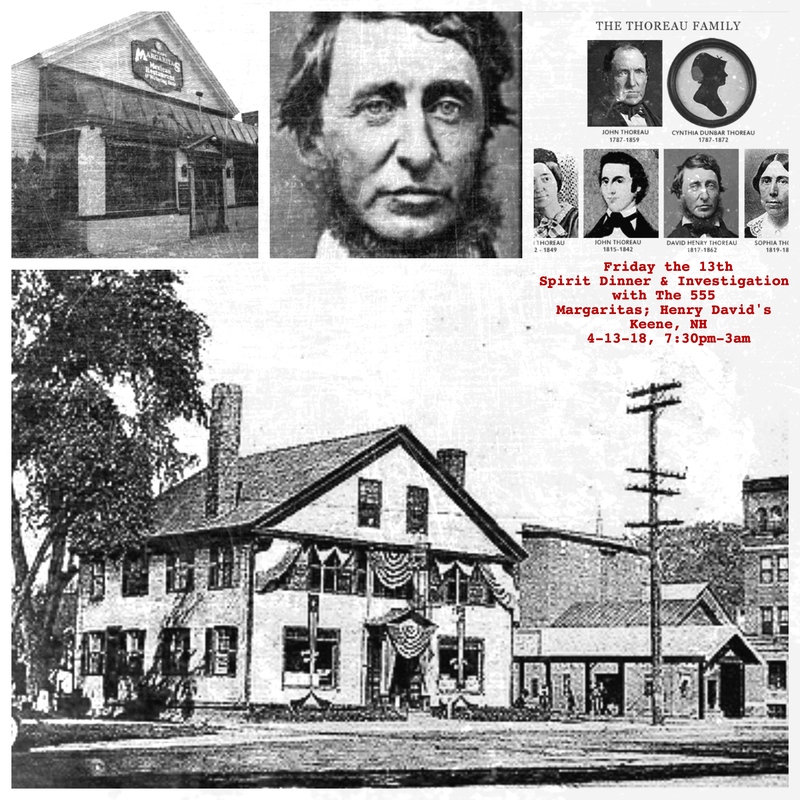 While Margaritas has inhabited the building since 1999, it has a rich history dating all the way back to 1785 when it was built by Asa Dunbar. Asa, formerly a minister from Salem Mass., became a lawyer in Keene the same year the house was built. He died in 1787 at age 41. His wife Mary supported her five small children by opening the house as a tavern. Her youngest child, Cynthia, born in this house, would later become the mother of Henry David Thoreau. Lead by the Investigators of The 555 Paranormal Productions! Learn the science and psychic elements of investigating with psychic mediums and scientific equipment! *No Refunds, but with 48 hour notice, tickets can be transferred to another event. *Abide by rules of location first and foremost! * ALL footage property of 555 Paranormal Productions. Not only what is filmed by the event host, but what is filmed personally as well. Please submit your works to The 555 and tag all works “The 555” if you share on social media. Your works represent The 555 Paranormal Productions. Sharing is caring!